Google  is often testing new features and methods on how to improve users’ experience with Google Search. And do you blame them? After all, Google Search is the bread and butter of the multi-billion dollar corporation known as Google and Google needs to continue innovating to keep the competition at bay. One of the way Google likes to change things up is by integrating its other services with Google Search. For example, Google has already integrated Google+ data to provide users with more relevant search results. Now Google is making another move, this time to provide better personalized search results — the integration of Gmail with Google Search. What this new Gmail integration does is it shows Gmail results on Google.com related to whatever query you are searching for on Google Search. The Gmail results are shown in the upper right corner and are initially hidden with users having to manually show them if they want to see them; clicking on a Gmail result opens the whole relevant conversation in a new window with the option to view it in Gmail’s interface, if desired. For example, let’s say you are searching “dotTech” on Google.com. A “dotTech” query will be run on your Gmail threads and displayed on Google.com in the upper right corner. You can then view any Gmail threads related to the term “dotTech”. Other features of this new integration is searching for contacts and recent conversations via Google Search and getting enhanced flight information. 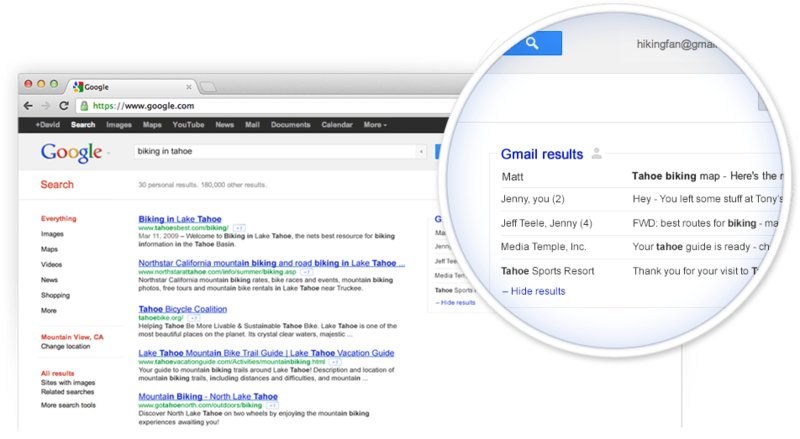 The goal behind Gmail integration with Google Search is obviously more personalized, relevant search results. However, I’m sure many people will raise an eyebrow about integration of personal e-mails with Google Search. If you are one of those people, know this. First of all, this new feature is opt-in, at least for the time being. This means you have to manually enable this feature if you want to use it. Secondly, Gmail results are available for you only; no one else can search your Gmail because you must be logged in to receive these personalized results. Lastly, if you are worried about Google viewing the contents of your e-mail… Google can do that with or without this new feature, if Google wanted to, seeing as they own Gmail. So, yeah. Nothing new to worry about. If you are interested in giving this feature a shot, take note the feature is currently in trial and available only on Google.com (not international Google websites) and for @gmail.com addresses only (Google Apps not supported yet). Hit up the link below to get started.